There’s nothing better than coming home to the smell of a delicious dinner that’s been slowly cooking all day. Throw all the ingredients for these Slow Cooker Turkey Meatballs into a slow cooker in the morning, set the timer, and you’ll have a warm, hearty meal ready when you come home. These slow cooker turkey meatballs are a dinnertime favorite, and they’re perfect for meal prep. If you have a large slow cooker, you might want to make a double batch so you have extra to store in the freezer. Put the ground turkey, breadcrumbs, garlic, parsley, and cheese into a bowl, add a dash of salt and pepper, then mix everything together with your hands. Like things spicy? Toss in a pinch of crushed red pepper flakes. Pro tip: roll up your sleeves, remove any rings, and clean your hands before plunging them into the meat mixture! Next, shape the meat into bite-sized balls. If you’re not going to cook them right away, place them on a baking sheet and store in the fridge until you’re ready. Heat a small amount of oil in a pan and lightly brown the outside of the meatballs before adding them to the slow cooker. Forget the store-bought tomato sauce — all you need is a can of whole tomatoes, chopped onion, a touch of dried oregano, some salt, and minced garlic (optional). We suggest sautéeing the onions before adding them to the slow cooker, but if you’re in a rush (or like me, just plain lazy) you can skip that step; they’ll cook just fine in the sauce. This is the easy part. Place your meatballs and sauce in a slow cooker, set it to cook on low for five or six hours, and then just walk away. 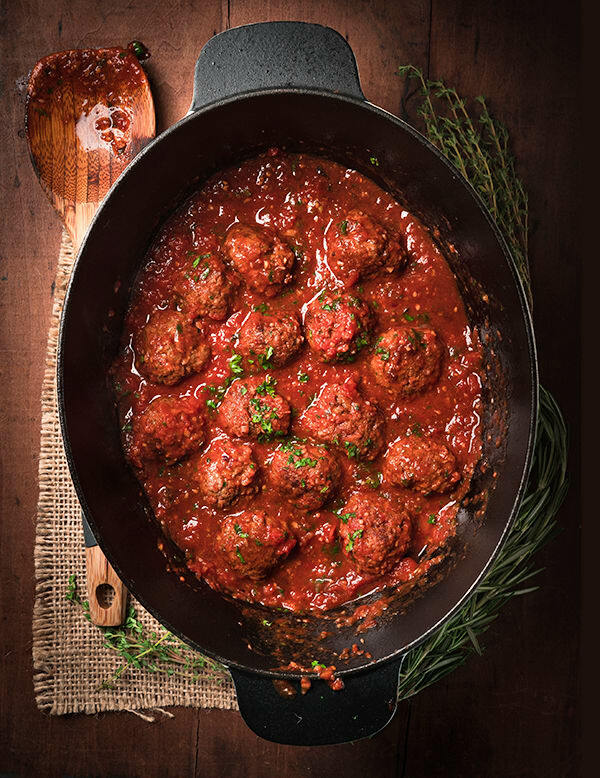 When you’re ready for dinner, your meatballs will be lusciously tender and the sauce with have developed rich flavor. These slow cooker turkey meatballs are flavorful enough to be enjoyed on their own, served with green beans or a simple salad. Or spoon them onto zucchini noodles or whole grain spaghetti, tuck a couple into a pita pocket with a slice of mozzarella cheese, or serve them with toothpicks as a crowd-pleasing appetizer. Pro tip: In a rush? Make this recipe in an Instant Pot — check out the instructions in the Recipe Notes! Throw all the ingredients for these turkey meatballs into a crock pot in the morning, set the timer, and indulge in a warm, hearty meal that night. Combine turkey, ¼ tsp. salt, pepper, egg, breadcrumbs, garlic, parsley, and cheese in a large bowl; mix well with clean hands. Roll mixture into eighteen 1½-inch meatballs. Set aside. Add half of meatballs; cook, turning occasionally, for 4 to 6 minutes, or until meatballs are browned on each side. Place browned meatballs in a 3-quart slow cooker. Repeat with the remaining meatballs. Set aside. Add onion to same skillet; cook, over medium-high heat, for 4 to 6 minutes, or until onion is translucent. Top meatballs with cooked onion, tomatoes, oregano, and remaining ¼ tsp. salt; cook, covered, on low temperature for 5 to 6 hours, stirring once or twice. Turn 6-quart Instant Pot to high sauté setting. Add meatballs; cook, turning occasionally, for 4 to 6 minutes, or until meatballs are browned. Add onion, tomatoes, oregano, and remaining ¼ tsp. Follow manufacturer’s guidelines for locking lid and preparing to cook. Set to pressure cook on high for 8 minutes. Follow manufacturer’s guide for quick release, and wait until cycle is complete. Carefully unlock and remove lid, taking care that there is no remaining steam. Add more veggies to this protein as part of lunch or dinner.